Chikalicious Dessert Bar and Dessert Club | I dream of having one hollow leg. I cannot only eat one thing at a meal. No matter the portion size, my appetite will never be sated with only a plate of pasta, a bowl of cereal, or a sandwich. I like to eat multiple things at mealtimes, almost exclusively as courses. I can be happy with a giant table of mezes or platters of Thai food, but if I had my choice, I would like to eat one (maybe two) things at a time before the next dish arrives. Part of it would be the need for my palate to experience many flavours, part of it would be that I like to eat hot temperature food hot and dislike when it starts to cool, and the biggest part of it would be to extend meal times. I love eating and want the moment to last as long as possible (or for dinner at home, at least as long as a 47-minute television drama episode). I lurve tasting menus that take three hours. I’ll always push for the prix fixe. When dining at home, I eat one thing at a time. For example, as I’ve said before, toast and an omelette is on my weekly roster. But I do not eat a plate with an omelette and two slices of toast. I eat the eggs, and then I prepare and eat each slice of toast individually. Then I have some fruit. Then I have yogurt. I have the privilege of time in my life, and I take full advantage. (This meal, by the way, is perfect for those 47 minutes). Loving courses and requiring variety means I always want some sort of dessert. Finding some is not a difficult a task in this city, especially given my love of ice cream and the numerous spots across the island and boroughs where it’s on offer. 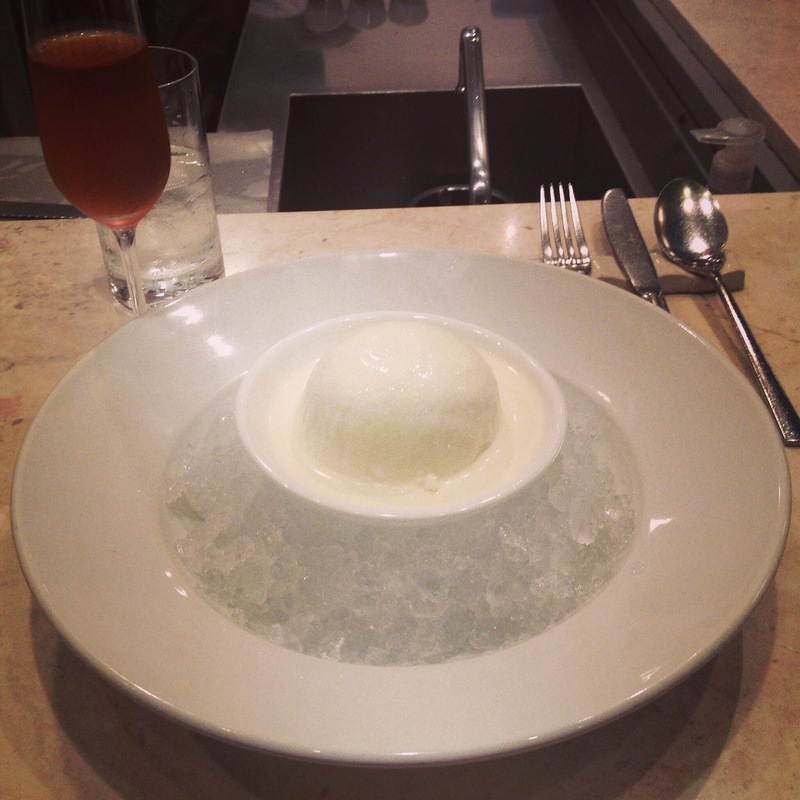 Sourcing something akin to a plated dessert without going to a regular restaurant can be harder, but not impossible. I wish that there were more proper places just to go for pie and tea (diners don’t count), but I’m happily making do without. Especially if I’m close to Chikalicious, which is a mini-chain that consists of the Dessert Bar and two Dessert Clubs. The Dessert Bar is a small sit-down dessert-only restaurant in the East Village where you visit for a $16, three-course tasting. I’ve only been once, but I’d return for the sugar splurge. The tasting includes an amuse bouche and petit fours to end, and the main course is a choice from a short list of desserts. When I visited, I chose the fromage blanc cheesecake. My preferences were all present: cold, creamy, and heavy on the dairy. Much lighter than a traditional cheesecake, this island was more like a mousse. But it was rich enough to remind you of its namesake dish. The island floated in a sauce that might have been simply heavy cream. Divine. I went with the optional dessert wine pairing and loved how the vin santo worked with the creamy dish. Across the street from the Dessert Bar is one of the Dessert Clubs (the other is in the West Village). This is an even smaller space, just a few tables and a counter, where you’re likely to hear hip hop blasting and be crammed in line with NYU students. It’s super casual and upon first glance, you might not notice the creativity of Chef Chika Tillman—creativity that I think might play out stronger here than at the Dessert Bar. For she takes your standard casual treats like cookies, cupcakes, sundaes and the like, and infuses whimsy and the clear skill of an experienced pastry chef. There is also shave ice, cronut knockoffs, and a number of plated desserts that veer way more comfy and easy than something you would see at the Dessert Bar. Despite not being someone all that into cake, I love tres leches. Perhaps because after the soak in all its dairy (three milks), it pretty much turns to pudding. 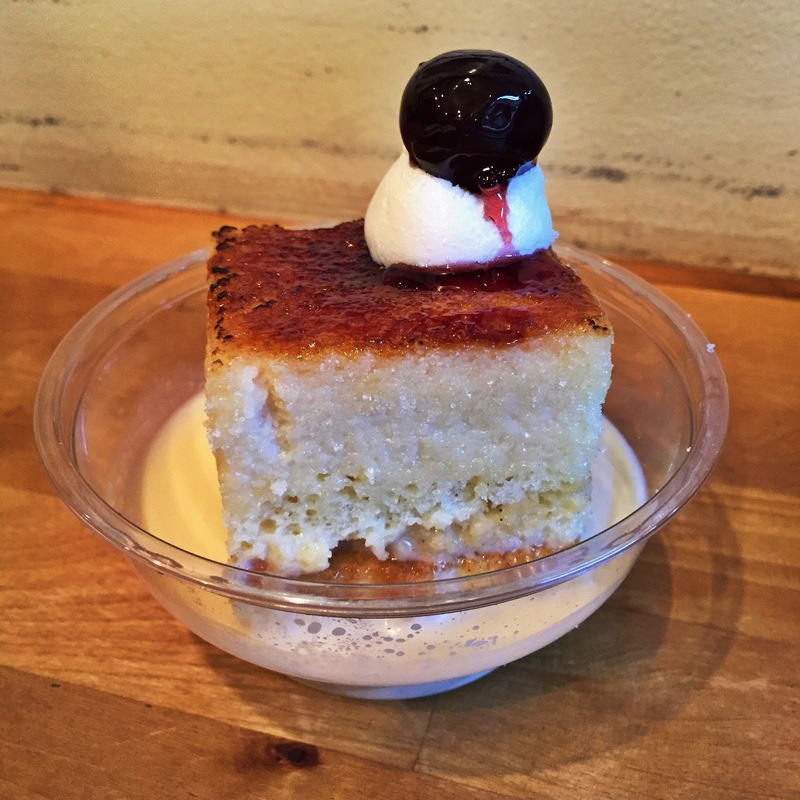 Chef Chika takes the basic concept of tres leches and elevates it with a denser cake, a bruleed top, what tasted like a whipped cream marshmallow, and a proper (Morello?) cherry. I love me the maraschino that I get with my tres leches cake from little Mexican places, but I won’t deny the improvement here. The bruleed top gave a textural contrast that is absent in traditional tres leches without fundamentally altering the heart of the dessert. The vanilla bean soft serve is killer. Really creamy with a good smack of proper vanilla flavour. While I do prefer eating ice cream in cones, her eclair cones aren’t my favourite as they can get very messy. There are a number of sundaes, and the one that I gravitate toward is the banana custard pie. 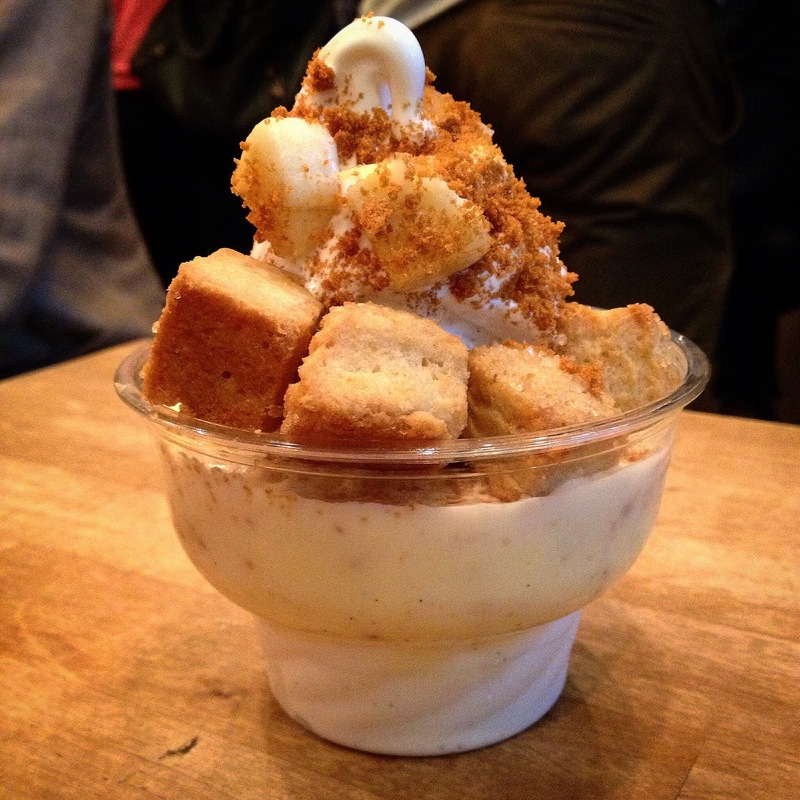 Cold creme anglaise, bananas, cookie crumbs, and mini (!) biscuits. So much fun. Giving the biscuits some time to sit in the custard was like eating cookies dunked in milk. It was a traditional banana pudding reimagined as an ice cream confection without resorting to just pudding and nilla wafers. It was beyond. The only thing that keeps me away is the crowd. And I guess the consideration of my waistline. The slush puddles of winter are also a factor. Do you hear that Mother Nature? You’re wreaking havoc with my ability to support small sugar-based businesses! This entry was posted in Eating Out: NYC on February 22, 2015 by historicalartfox.